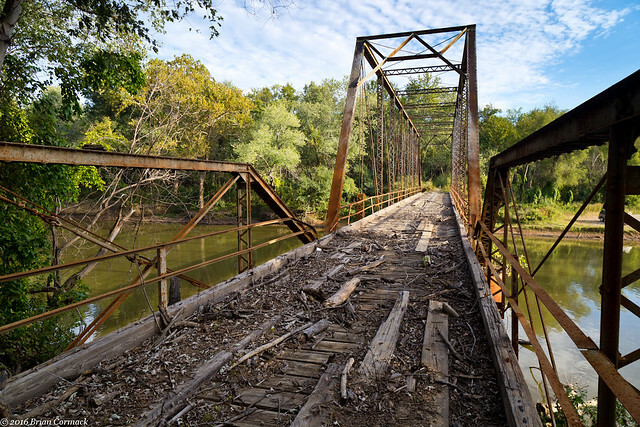 I headed out the other weekend to visit a pair of old bridges that cross the Petit Jean River in western Arkansas. 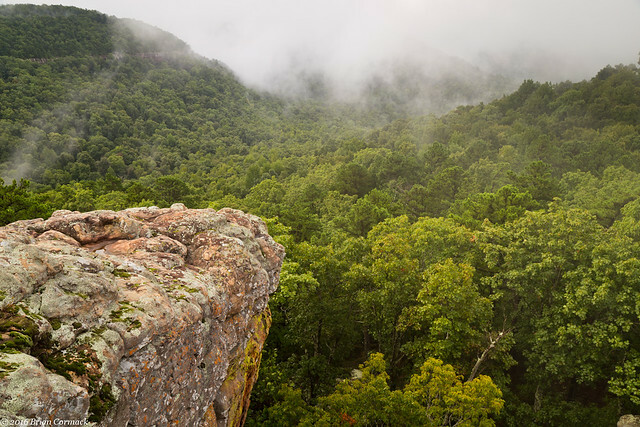 The river begins in the Ouachita Mountains and then flows for 113 miles to the Arkansas River (near Petit Jean Mountain). 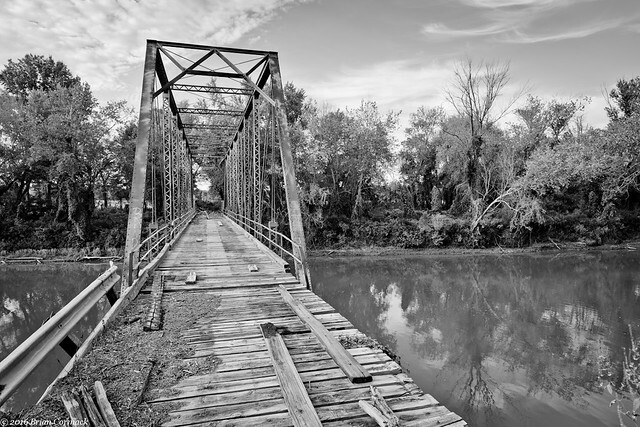 This old one-lane bridge crosses the river a few miles south of Magazine, in Logan County. The bridge was built in 1906, and was closed to traffic in 1998. Further east, the Petit Jean River passes beneath another old bridge near the city of Danville. 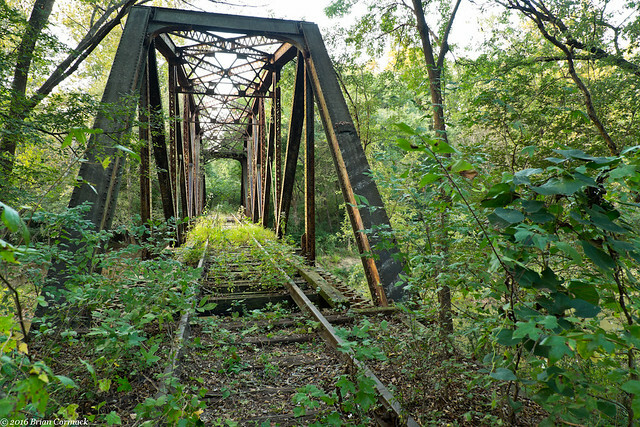 This is an old rail bridge, that was built in 1899 and was used by the Rock Island rail line. 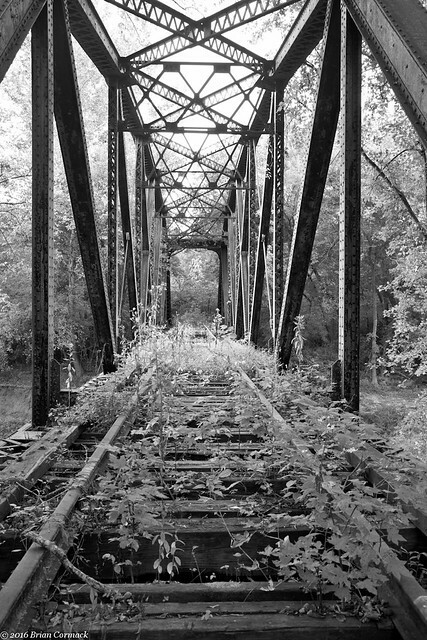 The bridge was abandoned sometime in the 1980s. 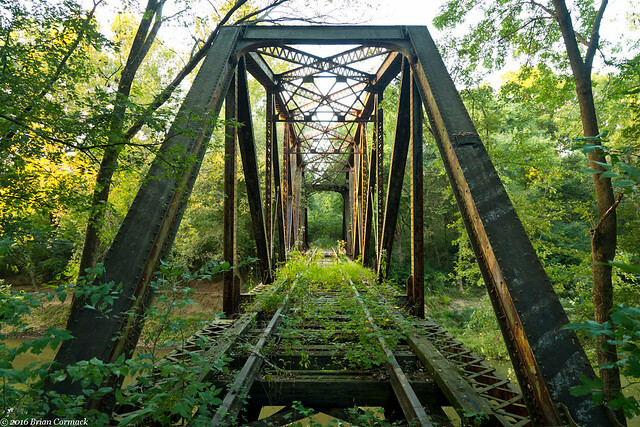 This bridge used to serve a rail line that stretched from Memphis to Amarillo. The bridge is in pretty bad shape, with some boards that are missing or that looked too rotten to walk on. I wasn't brave enough to go across. 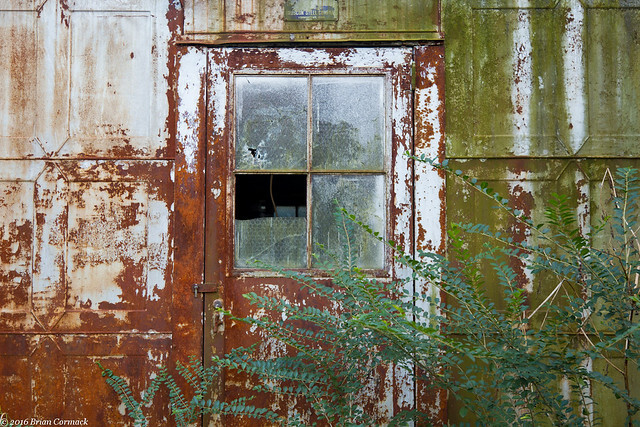 Near the tracks leading to the bridge was this old abandoned and rusty building, which was nearly covered in overgrown brush. I took some pictures before heading back towards home. Last weekend, I headed Downtown to make an attempt at getting a shot of the International Space Station as it made a pass over Little Rock. We went and set up at the top of a parking deck which provided good views of the skyline. The pass was to happen about 20 minutes or so after sunset, so while waiting I got a few shots of the city before it got dark. 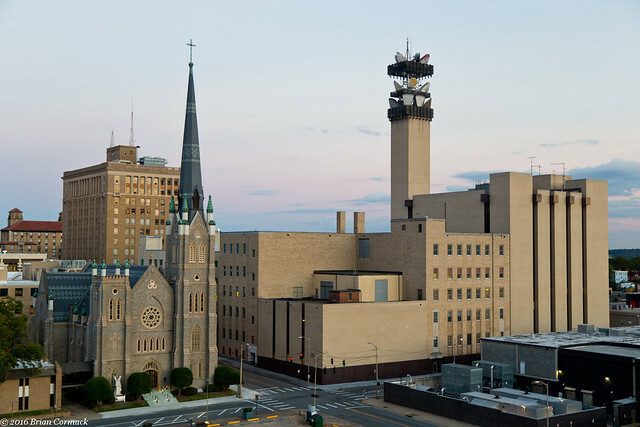 This is the view of the competing steeples of the AT&T Building and the Cathedral of St. Andrew, which was built in 1881 and was the tallest building in the city for several decades. 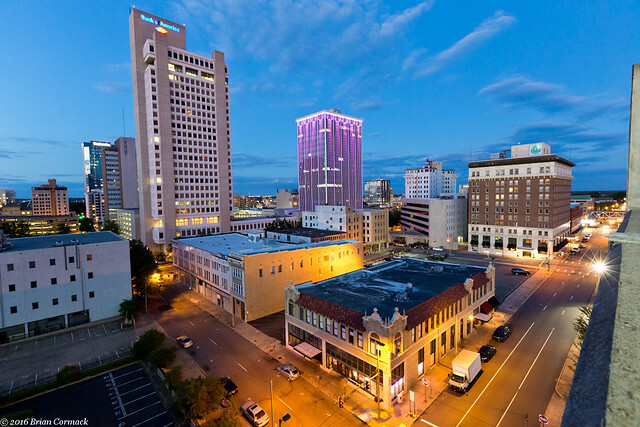 And the view looking north, towards the intersection of Center Street and 6th Street. The Space Station passed overhead, but my pictures didn't quite turn out like I wanted. Oh well. It'll be back sometime soon, hopefully! 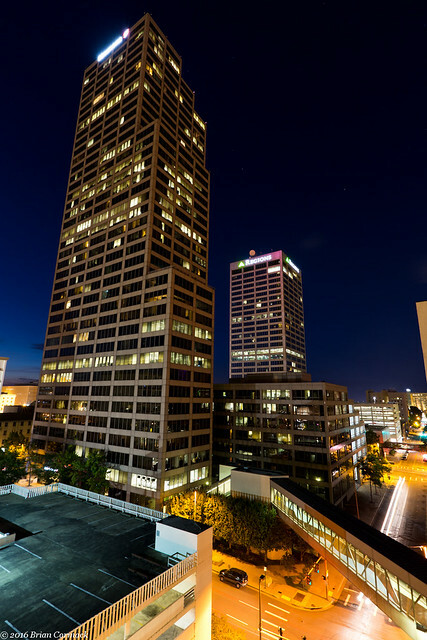 Before we headed out, I got one last shot of the Simmons Tower, which at 40 stories is the current tallest building in Little Rock (and in Arkansas). I haven't been camping since the baby was born in February, so I was looking forward to heading up to the Ozarks with some friends for a camping trip. We headed up after work on Friday, driving up Hwy. 7 while a heavy thunderstorm dumped tons of rain and lighting lit up the sky. The drive was going ok, up until our ride started to develop a few problems. 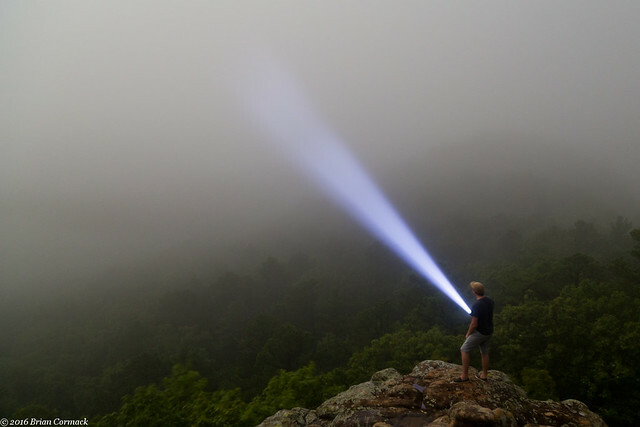 We were just barely able to limp into the campground at Sam's Throne and were then able to investigate the problem (it turned out to be a blown belt). Since there isn't an Uber service at Sam's Throne, we would be stuck there until someone could come up and rescue us. But if you're going to be stuck somewhere, Sam's Throne is an ideal place to be. 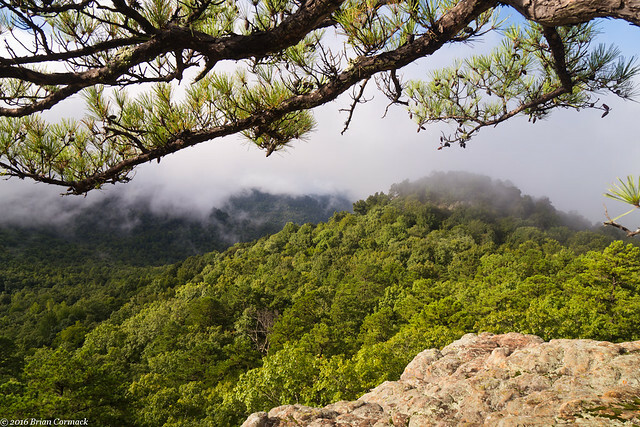 The campground is right by a short trail that leads to a terrific overlook that provides one of the best views in the Ozarks. 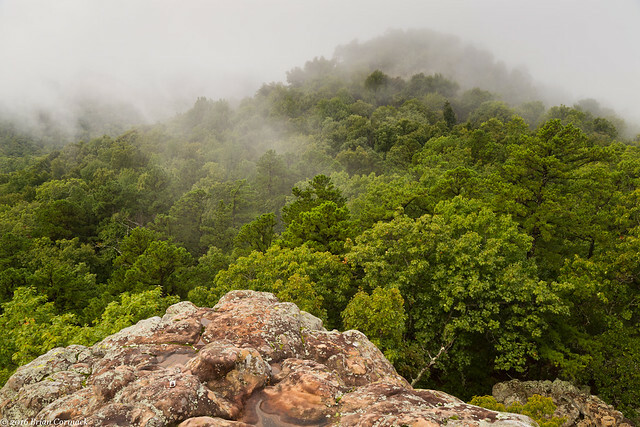 It was pouring down rain when we got there, but eventually the rain cleared out and we headed out to the overlook. 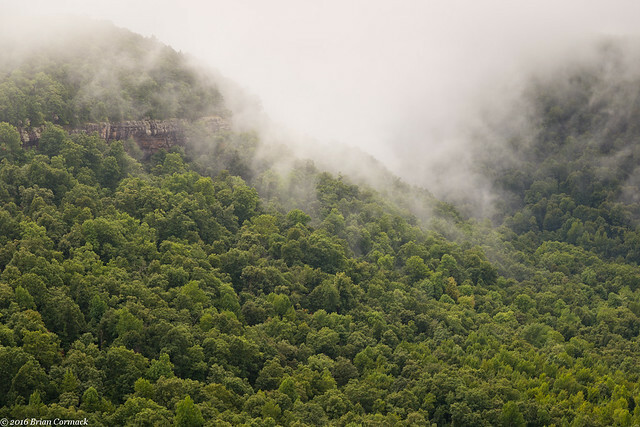 I had hoped that the rain would produce some cool fog down in the valley below, and luckily there was fog drifting up and around the mountains. A full moon lit up the scene. I tried to take some pictures, but couldn't get them to come out right. Something was wrong, and every shot was turning out too dark. I would later realize it was because I had managed to leave a polarizing filter on the camera. Whoops. The next morning we headed back out to the overlook to see what the view looked like at sunrise. 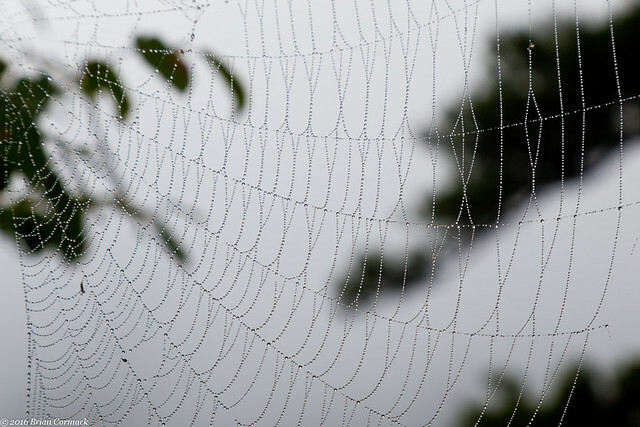 Along the way, I nearly walked right through this large spiderweb, which would have been unpleasant for both me and the spider. We got to the overlook and saw that there wasn't much of a view there, thanks to a thick blanket of fog. So we headed back out a few hours later, when most of the fog had cleared. We were able to get a good view of Sam's Throne, which is uniquely shaped mountain sticking up from Big Creek Valley. According to local legend, the mountain is actually named after someone named Sam. Apparently, back in the 1820's, Sam's sister was kidnapped. 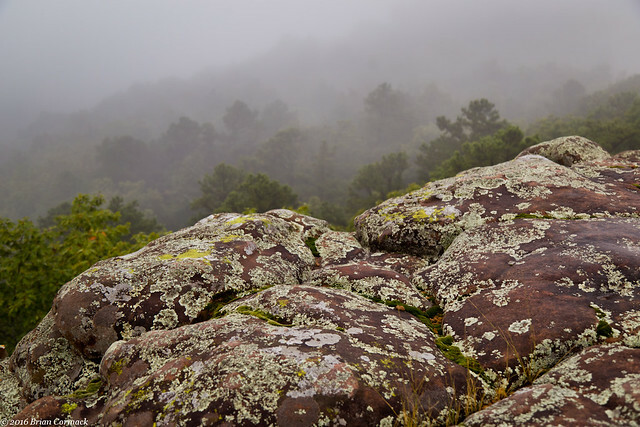 He was not too pleased by this, and went up to the top of the mountain and gave fiery sermons that everyone who lived in the valley below could hear. There's no telling if this story is actually true. Legend also says that Sam buried gold on the throne, but no one has found it (yet). Sam's Throne is also a popular spot for rock climbing, thanks to the large number of sheer cliff faces that can be found here. It was much safer to stand on the top and take pictures. 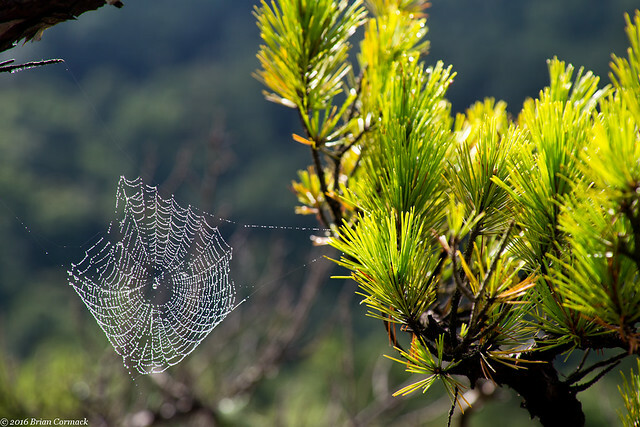 Also enjoying the view was this spider, who set up this web along a pine tree by the edge of the bluffs. It's a good location, a much better view than what we had back at the campground! The sun had managed to break through the clouds, but a few strands of fog managed to cling to the tops of the distant mountains. 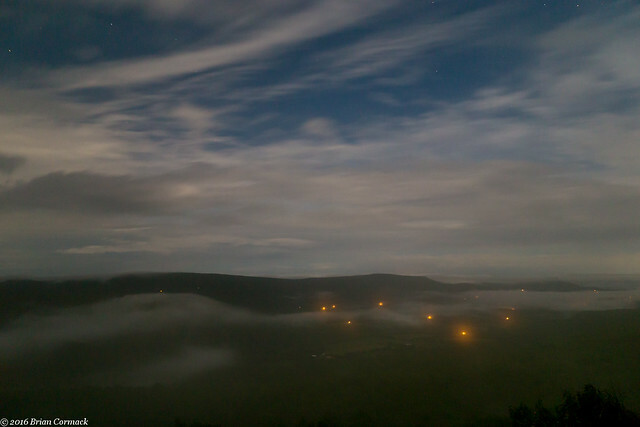 And a panoramic shot, showing fog drifting around Sam's Throne and the Big Creek Valley. 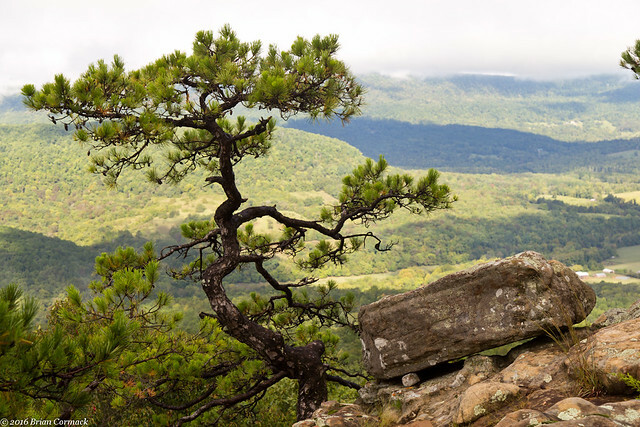 This pine tree was growing right on the edge of the cliff, and was twisted and gnarled so much that it almost looked like a bonsai tree. Thanks to the car trouble, we were still stuck at Sam's Throne that morning. Luckily, we had someone driving up from Conway to come rescue us. But of course, the person driving up to get us also had car trouble, and had to pull off the freeway near Russellville. So after a few more phone calls, we managed to find someone who drove up and retrieved our would-be rescuer and also helped get us back home. So finally late that afternoon I made it back to Little Rock, eager to get back up and visit the Ozarks again (with hopefully no car trouble along the way).